Spring is here and the smell of fresh cut grass is in the air. Life just feels better this time of the year. A few pieces of outdoor furniture makes it all more enjoyable. But STOP! Don’t even think about buying pre-made, overpriced imported furniture. Instead, MAKE IT! 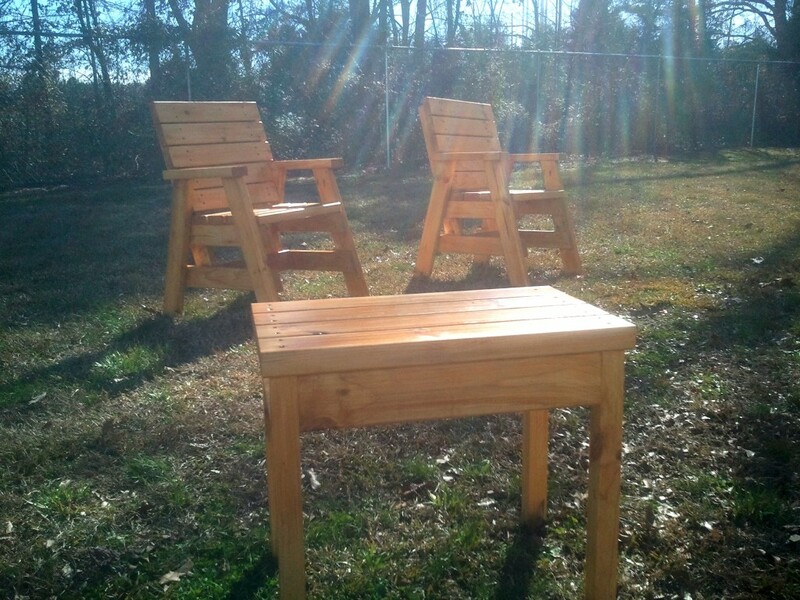 The best way to enjoy the great outdoors is by making your very own outdoor furniture. Making instead of buying is incredibly rewarding. Not only will you save money buy building instead of buying but you might learn something you didn’t already know. All you need is a couple every day tools. So if you have a couple hours and feel like getting something done, lets build some furniture! 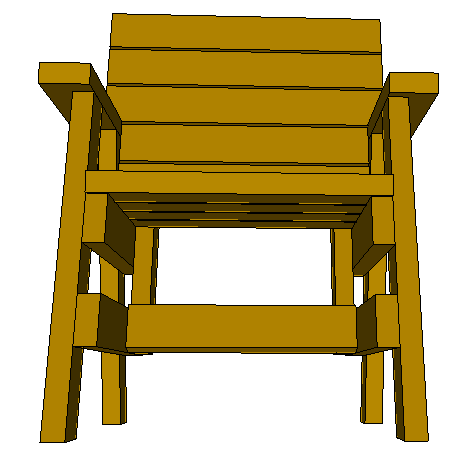 You can download the sketchup file I used by clicking here. Some type of saw. A circular saw or jigsaw will be fine. I also recommend a miter saw if possible. Kreg Jig. Not absolutely needed but I recommend attaching the arms with pocket hole screws. 2 wood clamps would help if you have them. A couple pencils to mark with and use as spacers. 2 thicker spacers such as large dry erase markers. A square of some sort, carpenters or small speed square. 16 2-1/2″ blue Kreg screws (if using the pocket hole method). Cut out all of the pieces according to this cutlist. 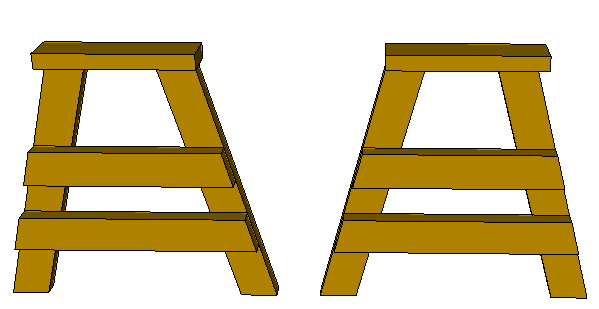 The top two boards are needed to make the table. As you can see there will be two rip cuts here to make the 1-1/2″ x 1-1/2″ x 18″ legs. 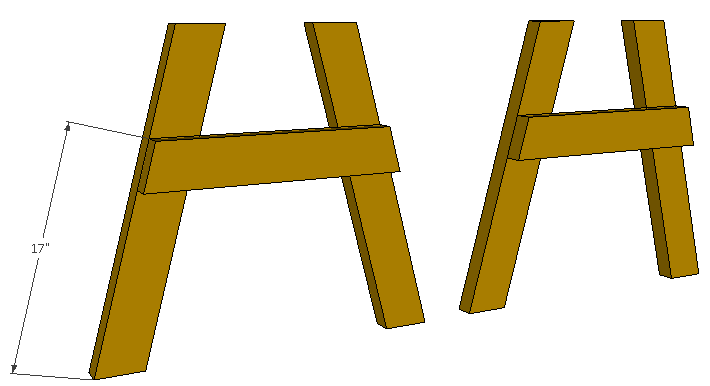 The bottom 6 boards are used to make one chair. 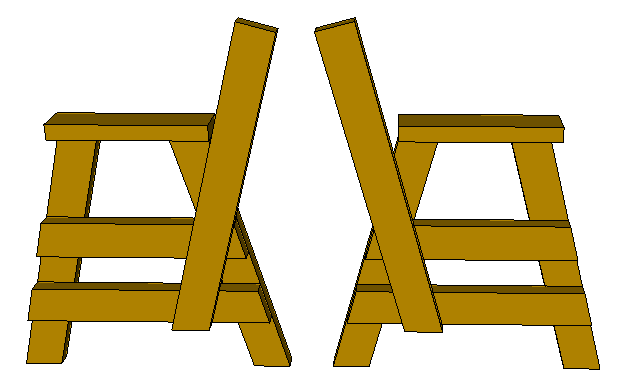 Simply duplicate the bottom 6 boards for two chairs (note: you only need an additional 5 boards for the second chair. You will have enough scrap to make up the 6th board). All angles on the cutlist are either 15° or 90°. Instead of giving each piece a label for you to remember I will refer to each piece by their length. Before we begin any assembly it will help if we layout the pieces. Stack all the 25″ legs in two piles for the left and right legs like shown. If you are using pocket hole screws to attach the arms, use a pocket hole jig such as the Kreg Jig to drill pocket hole screws on one end of each of the legs with the holes on the bad side. This is how you will attach the arms to the legs. Make sure the pocket holes are drilled with left and right legs in mind so you don’t end up with all the legs identical. Begin the leg assemblies with the legs oriented so that the pocket hole screws are on the top. On each leg mark 17″ up from the bottom. This will be the starting point for our 20″ pieces. 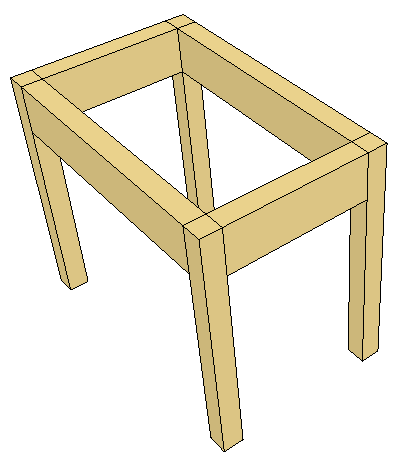 Place glue at this joint and align the 20″ piece so that the 15° angle is lined up with the leg. All of the leg joints in this build should be glued. A parallelogram is formed where the pieces intersect. Always screw the pieces together with two screws along the longer diagonal of the parallelogram. 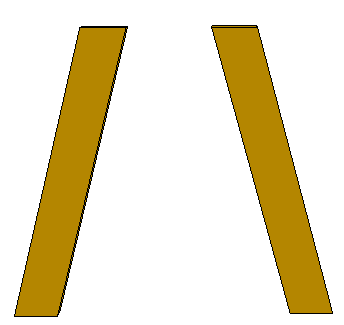 The picture shows a left leg assembly and a right leg assembly. I put both in the picture for reference purposes but I just build one at a time. Use an extra piece of 2×4 material as a spacer below the 20″ pieces to locate the 23-3/4″ pieces. Secure them to the legs with glue and screws as well. At this point we need to attach the 14-1/2″ arms. They are attached horizontally so that the inside of the arm lines up with the inside of the leg. One arm needs to be overhanging on the left, one overhanging on the right. If you drilled pocket holes you will secure them from below with the pocket hole screws. If you opted not to drill pocket holes you will attach the arm from above with 3″ screws. After the arms comes the 31″ back support. I apologize if this sounds confusing but take a look at the picture and it should make sense. The 15° angle of the back support will align with the bottom of the 23-3/4″ lower leg rail. The 31″ piece will then intersect the end point of the top leg rail. We need a left and a right according to the arm direction. 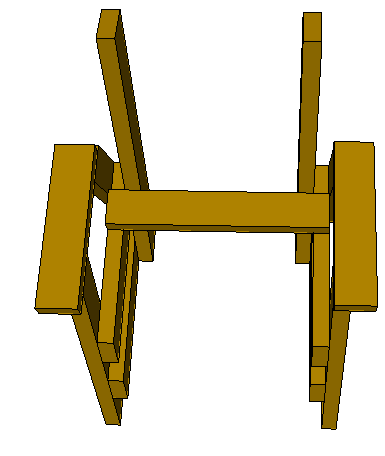 This joint is also glued at both horizontal pieces as well as screwed with two screws along the longer diagonal at each joint. With the leg assemblies done we can start adding the slats. The first 21″ seat slat is added with clamps first. Make sure they are perpendicular to the leg assemblies by using a speed square. Then screw the slat down with 2 screws on each side. Each of the remaining slats are secured with 2 screws on each side as well. 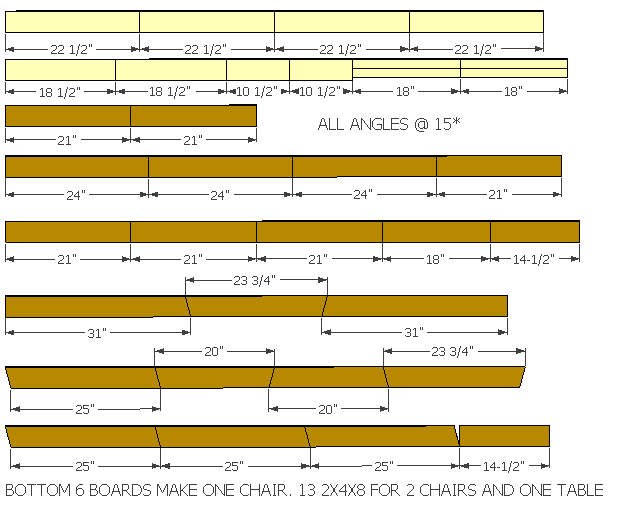 Add three more 21″ seat slats while using pencils for spacing. Using the larger marker spacers, add the first 21″ back slat. The second 21″ back slat is spaced with pencils. Add the remainder of the 24″ back slats with pencils as spacers. You can use a larger spacer item if you would like the slats spaced out a little farther. The final piece to install on the chair is the 18″ lower stretcher. The table will go together pretty fast. Drill pocket holes on each end of the 18-1/2″ and 10-1/2″ pieces on their bad sides. Screw the 10-1/2″ pieces to the legs first and then connect each leg assembly together with the 18-1/2″ pieces. The final pieces are the top slats. I have made some of these tables with no top spacing and others with the pencil spacers. Either way it is up to you. This is the most important step. You have to take a deep breath and pat yourself on the back. A job well done. Here are a few pics of some completed chairs and a step by step video series to guide you through the build! Jay, I am going to give this project a try also. 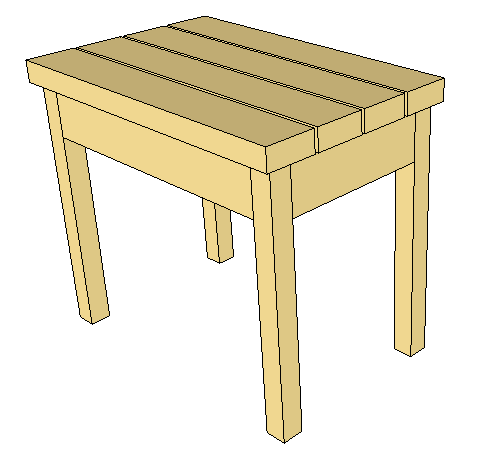 I noticed that the link to the sketchup of the table and chairs doesn’t work. I get a “Could not locate object” error. The cut list works, just not the sketchup. Thought I’d let you know in case its not just me. Link fixed. Sorry for the confusion. My Wife just had a new patio poured and these will look great on it. I am going with cedar. It should work out just right. Thanks Jay. You are very welcome Larry. Thank you for stopping by! I would love to see the final result!!! Do you have plans for a similar looking chair but the table is attached in between the 2 chairs> I think they call it a Jack n Jill chair? We would love to make these for our lake house. Hello Jennifer. At the moment I do not. I have been wanting to make the same setup as you describe for my porch this summer but have not drawn any plans yet. I’m rather large could we widen the chairs some and what do you think is good size. Hello! Yes, you can widen the chairs. It uses the same base design as my 4′ bench plans. I have a set of benches on my porch that are 5′ long from this plan. So, use any width you want! Just adjust for the appropriate slat size. Jay,thanks for all of the valuable info. Keep up the good work god bless you..
You are very welcome. Thank you for stopping by! Jay, very nice bench and chairs. I really like your design. Did you use pine 2×4’s or treated 2×4’s. What finish did you use on them? Keep up the good work. In the videos I used untreated pine and stained/sealed them with Thompsons Water Seal. I have built them with treated lumber as well. Thanks for the kind words. Hope you have fun making yours. Send me some pics when they are done! Good luck! 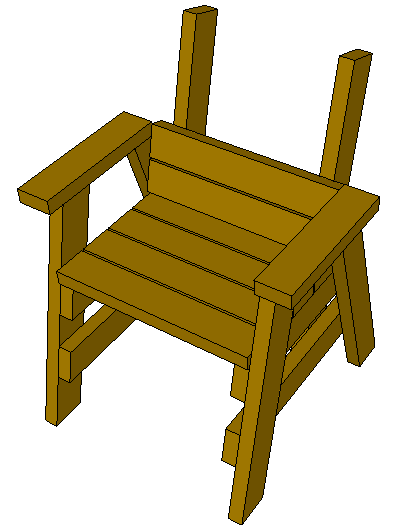 You only used pocket screws on the arms rests, could they be used for the seat and back slats as well? Yes they can. I use them on my benches that has the same frame. Check out this video and combine the two projects. I made this tutorial before I used pocket holes on the frame. Hi i just found out your youtube channel and internet site. I really like your video and designs. In particular I like that you use very few tools to complete most of the projects. Kepp up the good work. One question :) From what I see in the video you use no glue and no mortise tenon joints but you use only screws. Are the chairs strong enough? 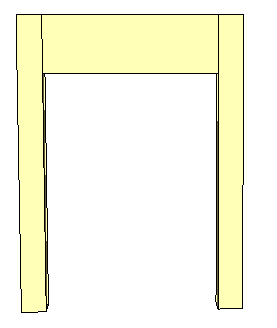 Do the chair cope with heavy persons and people that they tend to lean back the chair in the two back legs all the time? You did not mention my message :P.
I finally did build the armchair, and it is super strong !!! I build it with 45mmx95mm pine wood (that dimension is available here in Greece that it is close to 2×4″). I just think that seat is a little to short. Thx for the free plans thx for the youtube guide videos! I want to make the chairs 6″ wider. I want to make sure it is the square angle pieces the would be widened. Yes, that is correct. 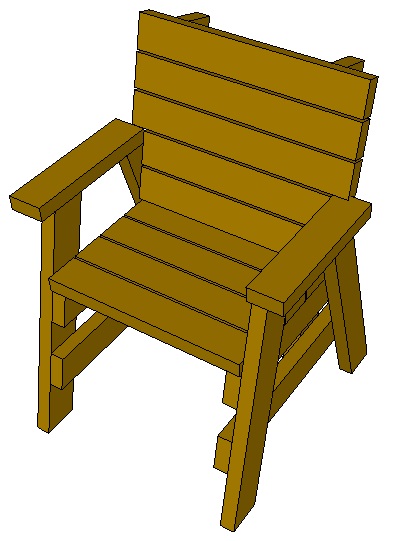 Just make the seat slats, back slats, and leg stretcher all 6″ longer. 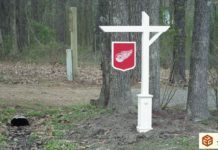 Jay, thank you for sharing this project and all your others! My mother loves the chairs and table. As someone who is just starting out in woodworking, I appreciate all the work you’ve done to make these things available. Just looking through your projects is giving me a lot of inspiration. Thank you! That’s very nice to read Jason. Woodworking is very fun and rewarding. Enjoy! I made a bench for my how which I had to modify and put one less slatvon the back due to a bad split didn’t see. Then made a bench with arm rests like the chairs but longer for my sister in laws birthday a few months early butvshe loves it. Thank you jay for the easy yet sturdy and economical designs. Hey Seamus. You’re very welcome and glad you enjoyed the projects. Whenever I need a project I check out your stuff first. I wish everything was as clearly explained and laid out as your directions! 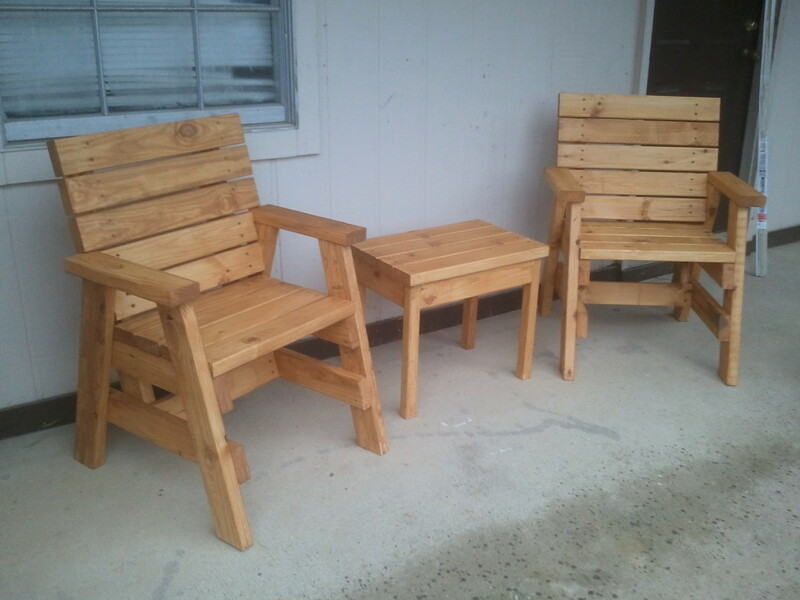 I built these arm chairs today and they look great! The one thing I changed was the backs at 22.5 instead of the 15 degree cut. Love it and thank you! 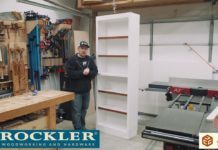 First off, Thank you Jay as this was one of my first woodworking projects aside from a workbench some shelves. Very nice instructions and video. Love these and cant wait to try more. The one thing I had to change due to my height/weight was the angle on the back of the chair. I used the suggestion of 22.5 for the second chair I made and it makes a world of a difference comfort wise. Some great videos!!! thanks again. Ever consider applying a small amount of construction adhesive to each pocket joint prior to assembly? Hello Jay My name is Tommy The videos and plans are awesome. 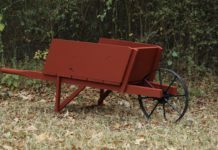 I am a newbe to wood working and I would like to try to build my grandson a wagon. I was wanting to know if you have any plans on one. By the way you make plans and advise on how to make them I believe that would be a good project for me to try.Thanks and keep up the good work. So, I decided that this looked easy enough that I couldn’t goof it up. I bought my lumber to make one chair to try it out. I marked all my cuts, measured twice and cut once. I went to assemble the chair and the sides didn’t line up at my 17″ mark, the tops of the legs touched and the 23 3/4″ board wasn’t close to fitting…and then I watched the video. I marked my angles on the wrong side of the speed square…this really throws everything off. Odd thing is, you started to mention the wrong side in that 1st video. Well, back to the lumber yard to get a couple new 2x4s so I can complete the project. I am using 10X21/2 and 10X3 screws for the assembly. When I came to the seat slats, I started splitting the slats when I put in the screws. Are you using 10’s or 8’s for your assembly? I have no clue what size screws I was using. I believe 10’s though. Predrill and you shouldn’t have that problem. Sounds like you are using really dry wood (which isn’t a bad thing). Thanks. The wood is dry, and I guess I was trying to avoid the extra work of pre-drilling. Just doesn’t pay to be lazy though. I made these over the weekend and painted them. I love the results and they are proudly displayed in my front porch. Thank you for the article Jay. I would like to make another set for the back yard but lighter. Do you think they would still come out good if used 1×4 material instead? I’ve seen a couple in 1×4 material. Never sat on one personally but I’ve seen some made. Love the work you have done! I have looked and looked and I can’t find the link to the cut list or the Sketchup file. I’ve tried different computers and three different browsers. So either I’m missing something obvious or something is not working. Sorry for the error. I’m not sure what happened but I’ve updated the first paragraph with a link to download the sketchup file. 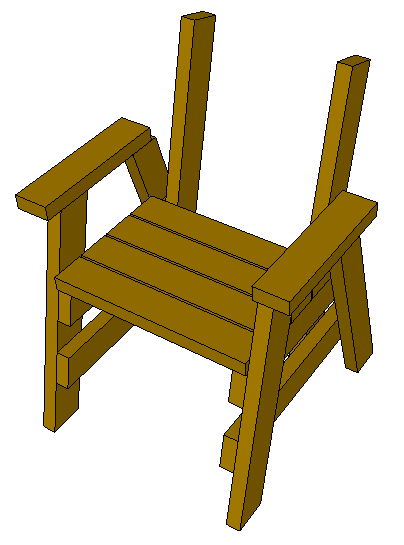 What is the model of the Kreg Jig you used for the chairs? Hey Jay. I been building these for a year or so now. Thanks for all the plans. I ripped out some old growth redwood from a deck that was 50 years old. Planed it and it’s gorgeous wood. I will send you pics of my twist on these chairs. I connect them, instead of having two inside arms it’s a table that connects them. I’ve built 2 out out store bought pine … but this old growth redwood will look awesome. Where you want me to send pics once done? Jay, I have an odd request…..I would like to build these at least four times this size. My wife wants giant chairs for the front yard. I’m guessing I would need to add more cross braces and of course more slats. Any help you can provide would be much appreciated. 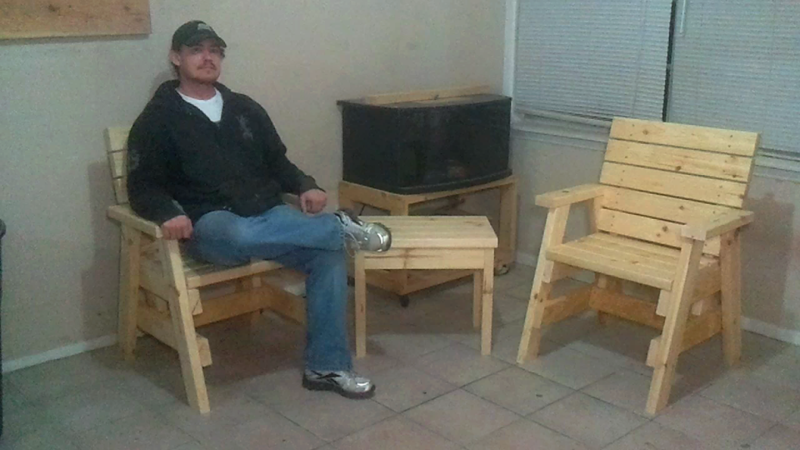 Hey Jay awesome project man , I’m a rather large person so finding chairs wide enough for me is impossible, I simply altered the measurements of the back and seat of your design and it works great, thanks for putting this out. Hey, I’ve fallen into a gig where I teach woodworking to kids with special needs. 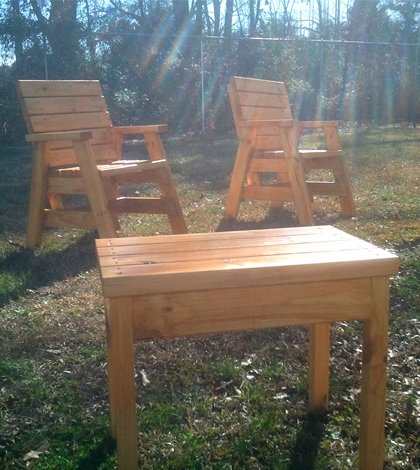 We just built your bench with some cedar I found in the school’s basement, and are about to start these. I have to thank you – the plans are clear and easy enough that I can use them with minimal modifications and the kids were SO excited when they finished the benches. It’s been a great thing for them. I think we’ll be putting our furniture in the playground, as there’s nowhere to sit at the moment. Cheers. About how much did you spend on materials? About how much did you spend on lumber etc.? My wife wanted a bench and wanted it with arms. I built the chair, wider. Worked great. Thanks for the plans. 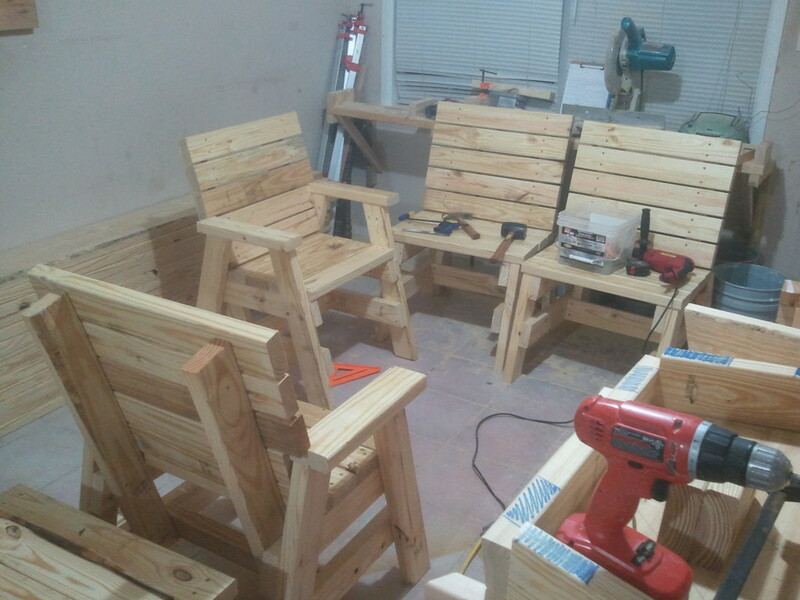 I just finished building the 2×4 bench and it turn out good. My neighbor wants me to build him one. Got no idea what to charge as of yet. I have built the horse bench frame and still working on the design on the back. It’s looking good too. I have also got another design I can put on the back to create another bench. What Thompson product would recommend for the bench. It’s made of pressure treated lumber. I bought your plans for the dresser and workshop cabinets. Projects for the summer. Thank for all you do. Keep up the pod cast I enjoy them.